The bullion version of one of the most increasingly popular coins is now available with the release of the 2017 Gold Somalian Elephant. Featuring a range of sizes and three different precious metals, the Somalian Elephant is a diverse program fit for any investors or collector. Today, the 2017 1 oz Gold Somalian Elephant Coin is available for purchase on Silver.com. 14th new design in the Somalian Elephant series! Face value of 1,000 Somali Shillings. Obverse features the all-new elephant design. Reverse bears the coat of arms for Somalia. African elephants are the largest land mammals in the world today, and one of the endangered. The creatures are often hunted not for their hides or meat, but merely for the ivory tusks that can measure several feet in length on a full grown adult. While elephants are generally viewed as one species, there are in fact distinct subspecies. On the African continent, this includes the bush elephant and forest elephant. It is the bush elephant that holds the title of world’s largest land mammal, but its cousin the forest elephant is no slouch coming in as the third largest land mammal in the world. Each 2017 1 oz Gold Somalian Elephant coin in this product listing is a BU specimen. Coins with a Brilliant Uncirculated condition exhibit no signs of wear and tear, however you may notice minor flaws such as breaks in the luster, spotted surfaces, or contact marks from the coining process. 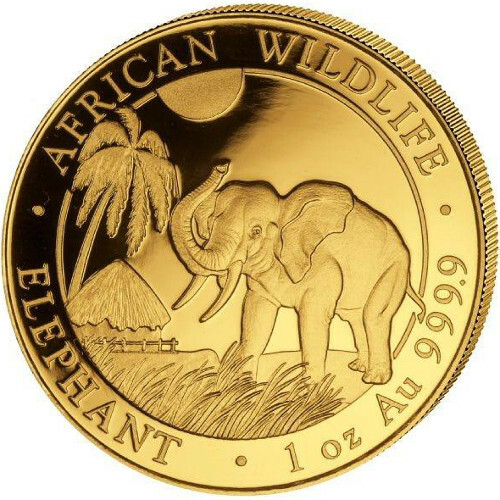 On the obverse of the 2017 Gold Somalian Elephant is the latest African elephant design. It features a single elephant standing on the savanna, with a small hut and grouping of palm trees rising toward the horizon in the background. The 2017 release of Somalian Elephants is notable for the continued expansion of the program, with the silver version featuring its first-ever fractional-coin releases, and the 2017 Gold Somalian Elephant adding a ¼ oz and ½ oz fractional coin, as well. Germany’s Bavarian State Mint produces the Somalian Elephant series of coins each year. Located in Munich, it is a state-owned entity of the Free State of Bavaria and first opened its doors in 1154. Please don’t hesitate to contact Silver.com with any questions you might have regarding these coins. You can contact us on the phone at 888-989-7223, reach out to us online using our live chat, or email us directly.